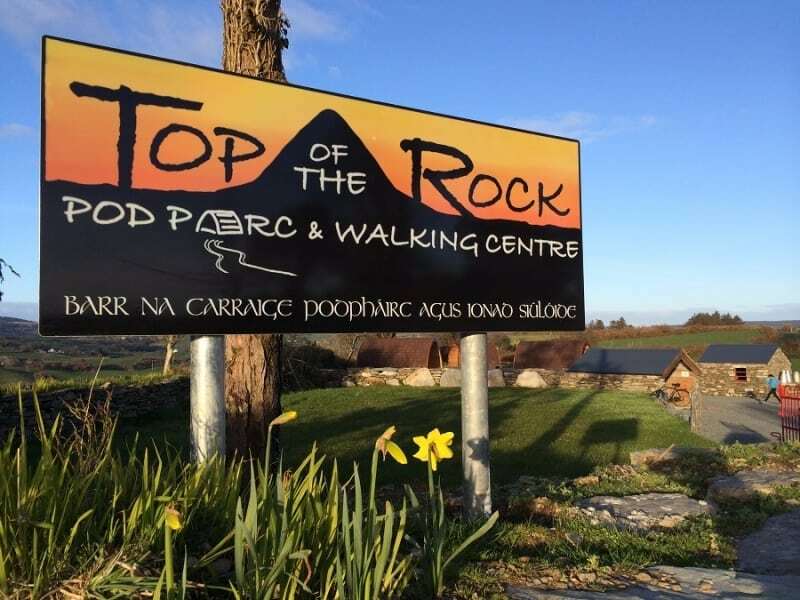 Welcome to the Top of the Rock Pod Páirc and Walking Centre on our family farm in Drimoleague, West Cork, Ireland. 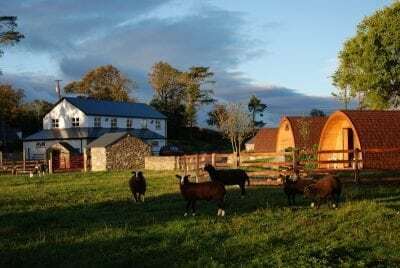 This ancient meeting place “Barr na Carraige” in the heart of West Cork has been brought to life with our seven camping pods, nestled into our grandfather Sam Ross’s old farmyard. We look out on an ever-changing vista of mountain, cloud and sunshine. 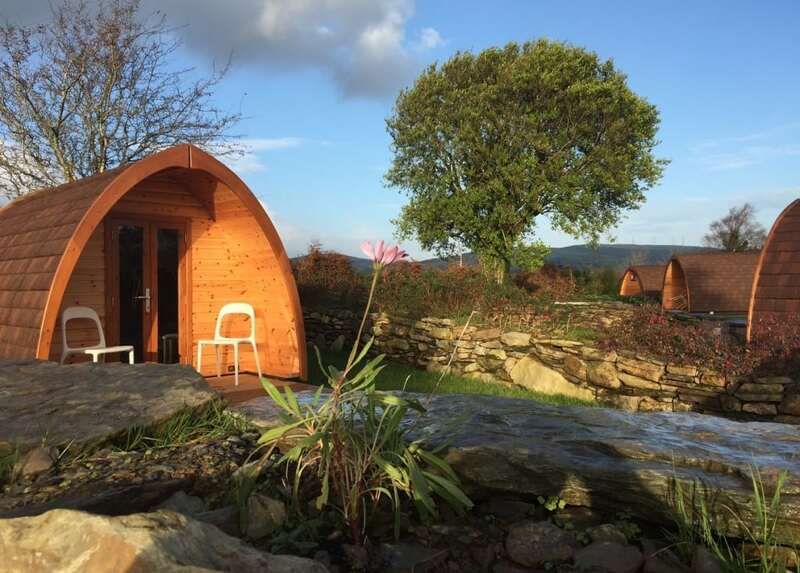 Our Pod Páirc is a safe and homely place for your family holiday or weekend away. It is also a perfect venue for couples with miles of walkways and river banks to wander along. Larger walking groups also come to avail of our group rates and wonderful facilities. Often people just come solo to take time out on their own. For the adventure enthusiast, there is walking, cycling and cross country running in the challenging landscape surrounding us. 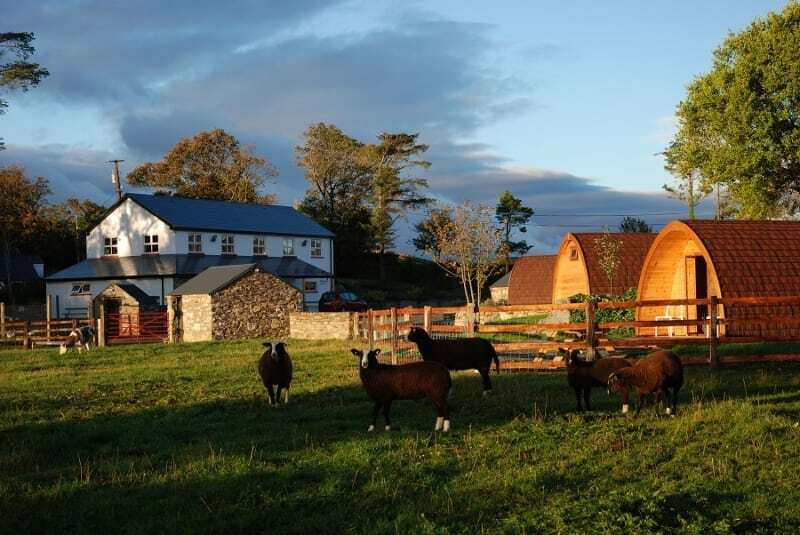 Our working cattle farm with its sheep, hens and ducks is a hive of interest for young and old alike, and you will enjoy meeting our dog “Daisy”. Here you will find a genuine welcome, clean modern facilities, stunning scenery and a real retreat from the busyness of life. The Top of the Rock is reasonably priced and is an experience not to be missed. • Standard: for 3 adults or a small family. Heat, light, and camp beds. Linen & towels not included. • Family: for 5 adults or a larger family: heat, light, camp beds & mattresses. Linen and towels not included. • Luxury: as in picture: includes a mini-kitchen, table, double bed, pull-out sofa and toilet/washbasin. Six fully-serviced hard stands and two tent pitches. WALKING CENTRE: Our Walking Centre is a large multipurpose space occupying the first floor of our main Pod Páirc building. It can hold up to 80 people for a function, yet it is equally suited to a small group sitting round having coffee. A bright well-appointed room, it has a panoramic view over the hills and valleys towards Castledonovan.